A Confederate monument featuring an 8-foot statue of a Confederate soldier has the words, ‘Our Confederate Dead’, inscribed on the base in Lee Park in the midst of a national controversy over whether Confederate symbols should be removed from public display on August 20, 2017 in Pensacola, Florida. Nearly one year after cities and states across the country began taking down Confederate monuments in response to a deadly gathering of white supremacists in Charlottesville, Virginia, a black man in Louisiana is arguing that a courthouse with a statue of a Confederate soldier at its entrance cannot fairly or impartially hear his trial. Ronnie Anderson, 39, from Plaquemine, Louisiana, believes that he is “not going to get a fair trial in a parish that allows the Confederate monument, in 2018, to be displayed,” according to attorney Niles Haymer, who has filed a motion to request that the trial relocate to a courthouse that does not prominently feature a Confederate symbol. Anderson has pled not guilty to a possession of a firearm by convicted felon charge and faces a criminal trial in front of a jury at the East Feliciana Parish Courthouse. An image of the Confederate Monument outside the East Feliciana Parish Courthouse. The criminal justice system is already weighted against people of color, who face harsher sentences compared to white people and are more likely to be arrested for low-level offenses. In Louisiana, black people are incarcerated at five times the rate of white men, according to data from the United Nations’ Sentencing Project. The monument, the motion claims, is a kind of visual warning: Black people will not have an equal opportunity at this courthouse. 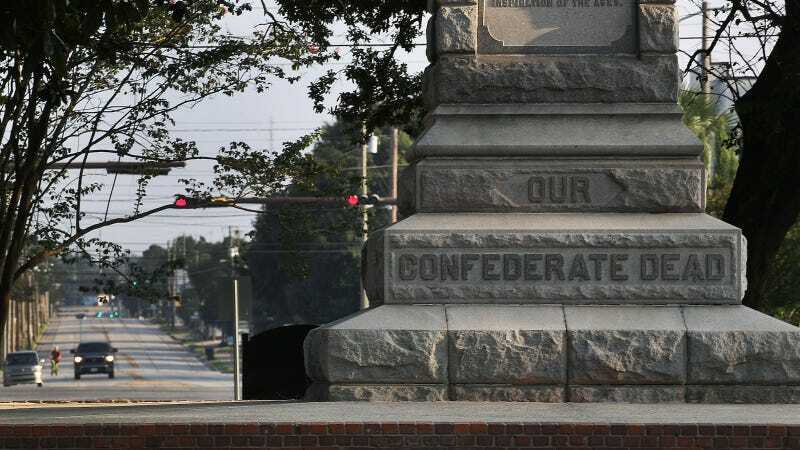 The monument “is not just memorializing the Confederacy but revering the Confederacy and what it stood for, right in front of the very place that African Americans go to see fairness and impartiality in the court system,” the motion reads. It further argues that the presence of the monument, “carries a message to African Americans of intimidation and oppression, communicating that justice may not be fair and impartial at a Courthouse that was nostalgic and sentimental over the institution of slavery that the Confederacy fought for in the American Civil War.” The Louisiana state criminal code allows for a change in venue if Haymer can prove that “by reason of prejudice existing in the public mind or because of undue influence, or that for any other reason,” Anderson would not receive a fair trial in the parish. In the court of law, however, it is much harder to demonstrate the harm Confederate symbols inflict on black Americans, as defendants must show they have suffered concrete or imminent injury as a result of the imagery. In 2017, a black lawyer in Mississippi named Carlos Moore filed a lawsuit claiming that the state flag, which depicts the Confederate Flag, violated his 14th Amendment rights and made him feel like a “second class citizen.” As a prosecutor, Moore routinely presented cases at state courthouses under the flag. The Fifth Circuit district court, which includes Louisiana, dismissed the lawsuit, however, saying that Moore was unable to demonstrate a such an injury, and thus the case had no standing. When Moore became the first African-American municipal judge in Clarksdale, Mississippi, he promptly removed the Mississippi state flag from his courtroom. Nelson Tebbe, a Cornell University constitutional law professor who studies free speech and religious freedom, believes that Anderson and Haymer may be able to challenge the constitutionality of the courthouse’s Confederate monument. The statue could easily “send a message of subordination and unequal citizenship to African American citizens who are seeking fair judicial process in that particular parish in Louisiana,” he said. Anderson can claim a concrete injury: that “his judicial process can’t be fair and impartial when its happening literally right behind a Confederate monument that sends a racialized message on behalf of the government to the African American community and the population of that parish,” Tebbe said. Sam D’Aquilla, the District Attorney for the 20th Judicial District, disagrees. “The issue about the statue removal has arisen over the last few years and our local governing authority…has determined it is not inflammatory but actually a part of history and voted against removing the statue,” he told the Advocate, referring to a 2016 decision by a non-judicial committee that decided there was no money, or substantive reason, to move the statue. The hearing for Haymer’s motion is set for August 7.